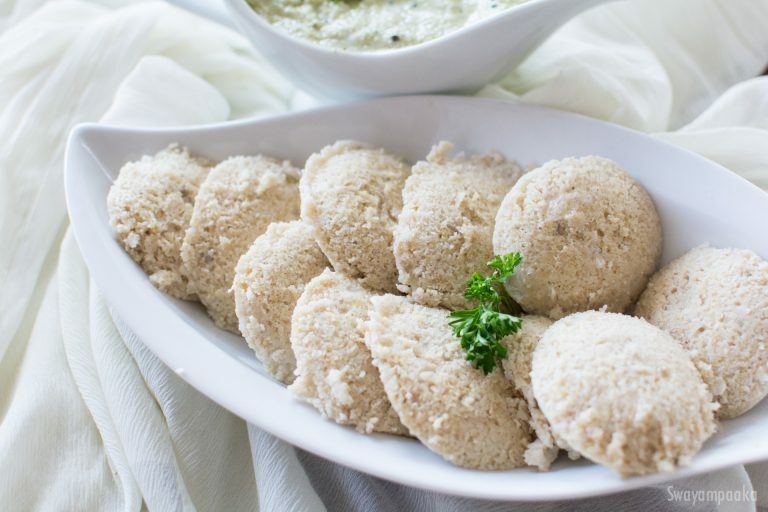 Millet idli recipe using Foxtail millet /navane . Idlis are the most popular breakfast of Southern India. It is steamed, healthy, balanced breakfast to start the day. Best food for the growing kids too. Generally idli is made of rice and urad dal, in this particular recipe I am using millets to make the idli. You can use any millet available to prepare this healthy dish. Wash and soak urad dal in 1¼ water overnight or minimum 3 to 4 hours. Wash and soak millets along with methi seeds in 1 cup water overnight or minimum 3 to 4 hours. Grind the urad dal in a grinder or mixer(use water as needed) along with soaked water to fine paste(takes around 12 minutes in grinder). Add little more water if needed. Drain the water from the soaked millet, add only millet to the grinder, grind it for a minute. Grease the idli plates keep it ready. Mix the fermented batter thoroughly, pour it to the greased idli plates. Steam cook this idlis on medium high heat for 12 to 14 minutes and then turn off the heat. After a minute, remove the idli from the plates using the wet spoon.